Download Middle School themed activities! 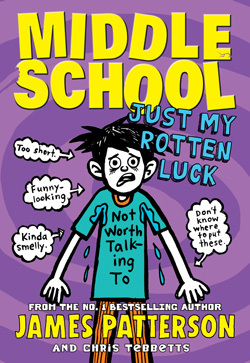 If you love the James Patterson Middle School books, check out the new book in the series, Just My Rotten Luck! In the new book, Rafe goes back to Hills Village Middle School, and he’s being forced to take ‘special’ classes. He also finds himself joining the school American Flag Football team with his main tormentor, Miller the Killer! But as always, Rafe has a plan! He wants to make this year better, so he decides to start a super-secret art project to rock the school and make a play to save his team. In the books, Rafe and his friend Leo write and illustrate the Middle School Stories together. Get together with your best friends and complete the activities! You can design a book cover, complete a wordsearch and write your own story.